Length availabe from 14" to 26"
Note: This Necklace is MADE TO ORDER: Please allow 7 to 10 business days to ship - Free USA Shipping. 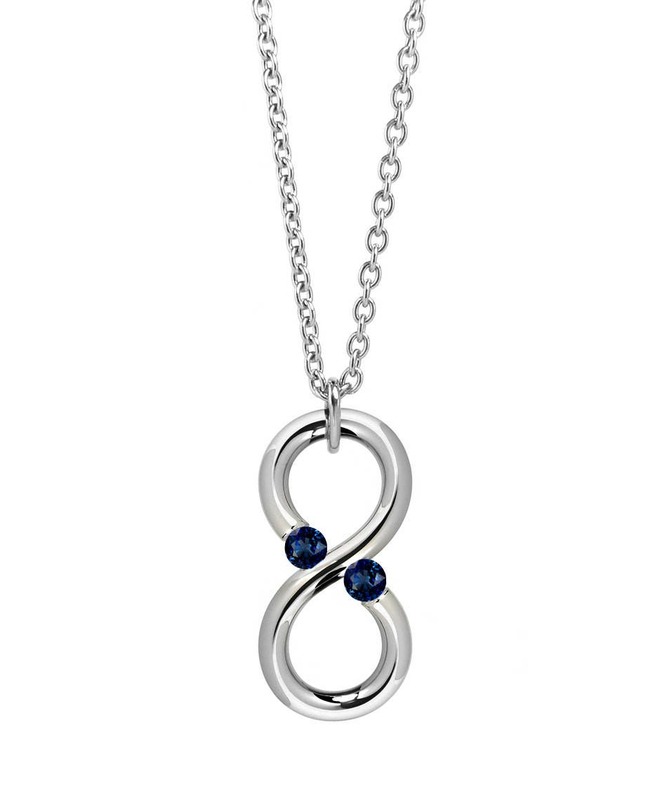 The infinity necklace can symbolize unity, eternity, empowerment or everlasting love. The ouroborus symbol, which can be traced back to ancient Egypt, depicts a serpent eating its own tail and represents rebirth, the cycle of renewal and immortality. The infinity symbol has significance in the Tarot, appearing on the magician card as a halo floating above the magician's head. According to paranormality.com, the card can have numerous meanings, including power and possibility. Thanks to the Steel's springiness we were able to set the stones or beads only by its shank, without the use of common prong and bezel settings, which tend to loosen with wear and tear. The stones overlook is fully exposed in its beauty and brilliance. The mounting is stronger than most conventional noble metals and one of the benefits is the elimination of the uncomfortable entanglement of prongs in wool clothing etc...By statistical, practical and mechanical point of view this kind of setting will never loose the Stone. Only by the use of a special tool, a Stone can be de-mounted from this settings.